The First Land Grants. The road at the bottom of the map is Queen Street, first known as Kingston Road. It is the surveyor’s base line from which they laid out the grid of lots. The road at the top is Danforth Avenue. The double lines running north to south are sidelines dividing the area into three sections. 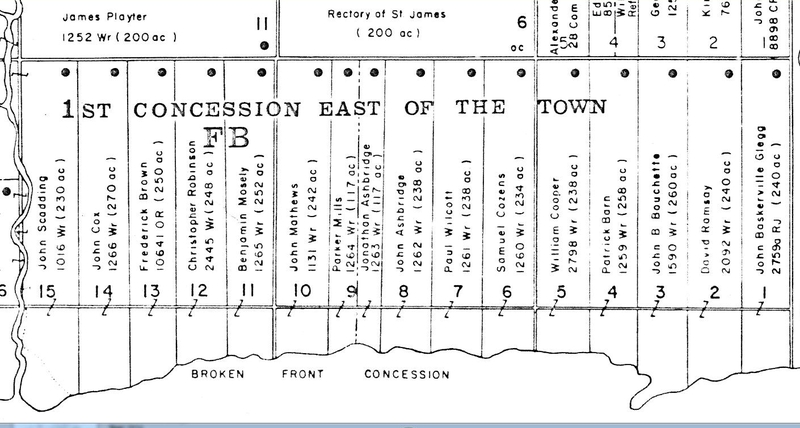 Each section is subdivided into 5 lots numbered from east to west with the name of the man who owned that farm. The Don River is at the west and what is now Victoria Park marks the boundary between the Township of York and Scarborough. The sideline between 5 and 6 is Coxwell Avenue. This is a modern Google Map laid over an early map so you can get an idea of where the modern roads are compared to the original lakeshore at Ashbridges Bay. Close up of the 1878 County Atlas Map of the Township of York. I’ve turned the map on its side so that west is at the top, east is at the bottom; south is at the left and north is at the right. The map is somewhat distorted but clearly shows the layout of the various farms. Each of the farms between Greenwood and Coxwell were owned by the Ashbridge’s family and men who married into the family e.g. Sam Hill, a farmer and ice dealer. 1878 Country Atlas with modern overlay. I’ve turned the previous 1878 County map so that could overlay a grid with modern streets shown. It then becomes quite clear how our street system is based on the farm boundaries. 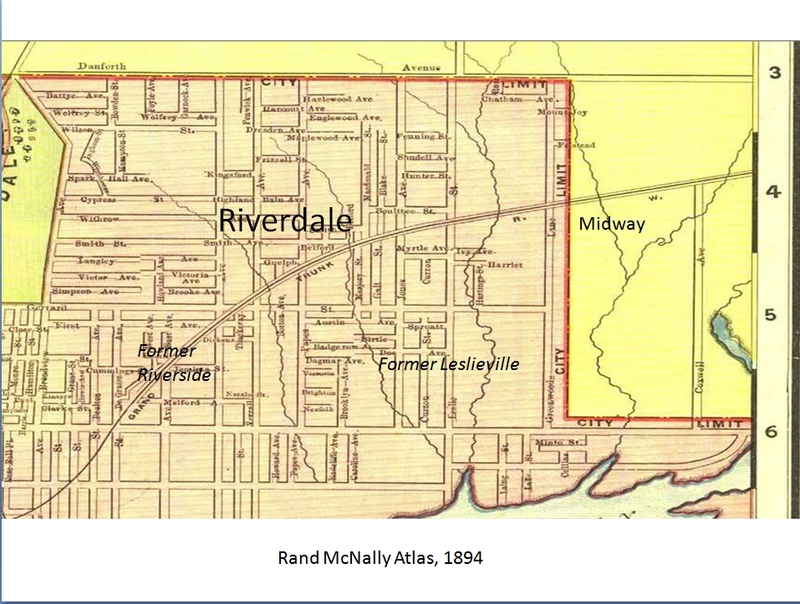 City Engineers Map 1892 Showing the boundaries of the City of Toronto as “City Limit” in red. The lot lines still show, but streets hadn’t been built on them yet. The lot lines were the farm boundaries and had muddy lanes the farmers used to access their fields. Coxwell Avenue is a rough dirt road. 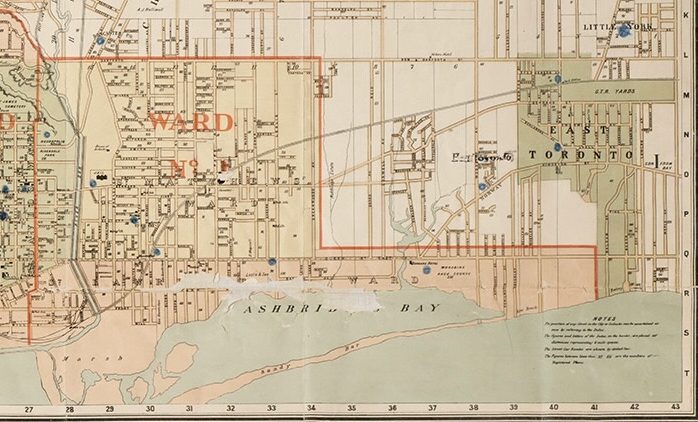 In the 1896 map, E.H. Duggan, a real estate developer, now owns the farms between Woodfield Road at the east of the Ashbridge Estate and Coxwell Avenue. He has subdivided the area directly west of Coxwell Avenue that includes Rhodes and Craven, holding it for future development. Erie Terrace is not yet built on. Houses show on the map as little black rectangles. Rhodes Avenue is very faintly marked between Gerrard and the railway tracks. Upper Gerrard exists as does lower Gerrard but they are both not much more that rutted dirt trails. If you look carefully at the very bottom of the map at the lower right you can see an estate marked “E. Simpson”. A knitting mill was built there in the 1860s by one of the most enterprising and important business men in the area, Joseph Simpson (1824-1898). I will write a separate story about this intriguing Jewish businessman from Charleston, South Carolina who panned for gold in the 1848 California Gold Rush and came to Canada as a “draft dodger” because he did not want to fight for the Confederacy. Ernest Simpson, the E. Simpson on the map, was his son. 1893 Goad’s Atlas map showing the farm boundaries. 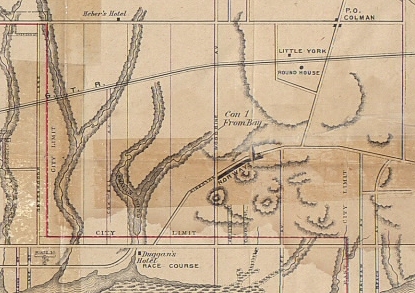 In the 1893 map Reid Avenue (now Rhodes Avenue) has been laid out north of the track. The subdivision has been registered (the numbers in the oval). South of the tracks no road has been opened up yet Erie Terrace (Craven Road) is now a registered subdivision (see the number) and has been divided up into tiny lots on its side. 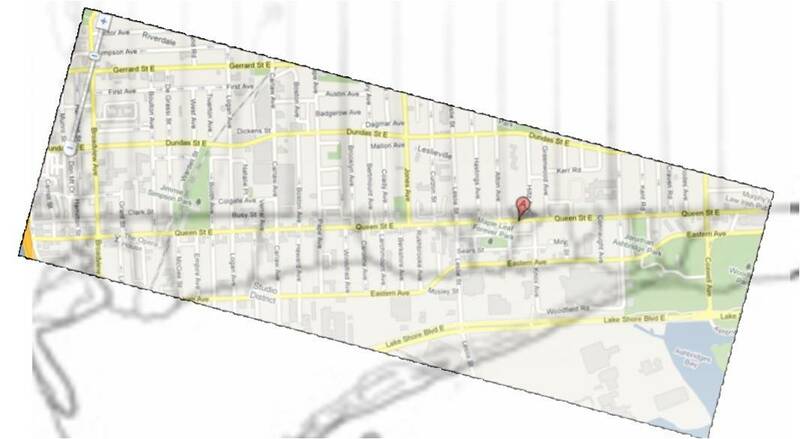 Coxwell Avenue has also been subdivided all along its west side to Danforth Avenue. Duggan intentionally developed Erie Terrace as a “shacktown” with tiny houses on tiny lots and no infrastructure. At the same time, he held back the farm to the west, intending it to be developed later for more lucrative lots with more substantial houses. That is why the west side of Erie Terrace (Craven Road) was not built on. 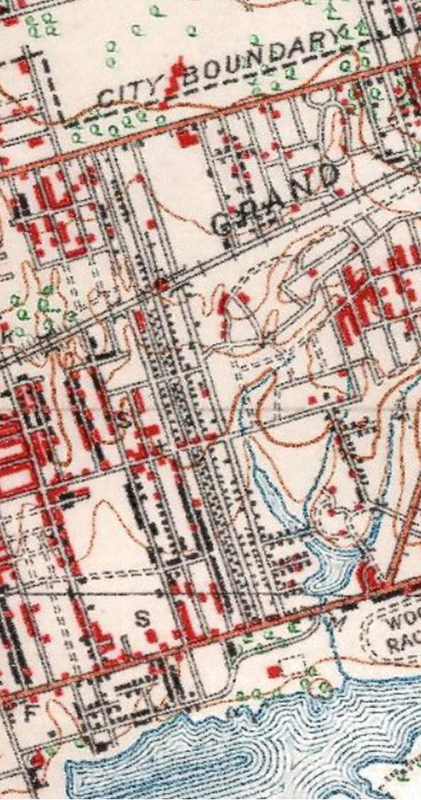 In this 1903 map, Erie Terrace is not yet built on. Houses show on the map as little black rectangles. Rhodes Avenue is very faintly marked between Gerrard and the railway tracks. Upper Gerrard exists as does lower Gerrard but they are both not much more that rutted dirt trails. If you look carefully at the very bottom of the map at the lower right you can see an estate marked “E. Simpson”. A knitting mill was built there in the 1860s by one of the most enterprising and important business men in the area, Joseph Simpson (1824-1898). I will write a separate story about this intriguing Jewish businessman from Charleston, South Carolina who panned for gold in the 1848 California Gold Rush and came to Canada as a “draft dodger” because he did not want to fight for the Confederacy. Ernest Simpson, the E. Simpson on the map, was his son. Joseph Simpson grazed his own sheep where Gerrard Square is today. Only the best wool was good enough for his Toronto Knitting Mills. 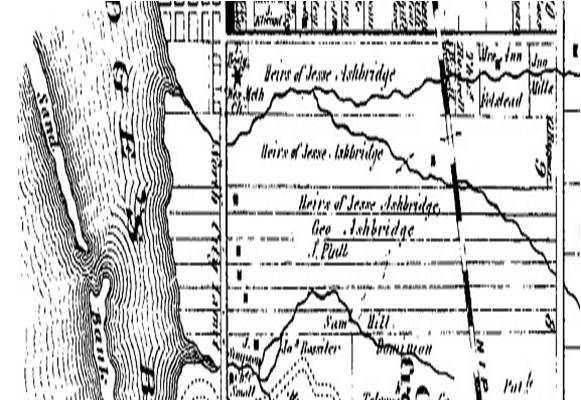 1894 Map showing the 1884 City of Toronto annexations in the East End. The area in yellow is still in the Town of York and could not be systematically developed for housing until it was part of the City of Toronto because there were no water mains, sewers, fire or police services. An 1891 map given away by the Bank of Commerce showing the Ward boundaries. In 1909, after a referendum, the City of Toronto annexed the areas marked with pink, as well as the Village of East Toronto which lay between the two pink areas on the right of the map. Duggan has developed Ashdale Avenue as a slightly more upscale working class street than Erie Terrace (Craven Road). The backyards of the houses on Ashdale extend to Erie Terrace. There are no houses, therefore, on the west of Erie Terrace — just a few sheds. The houses are little rectangular squares. The ones in yellow (all of them) are made of wood or are roughcast (stucco and wood). Erie Terrace is on the right. 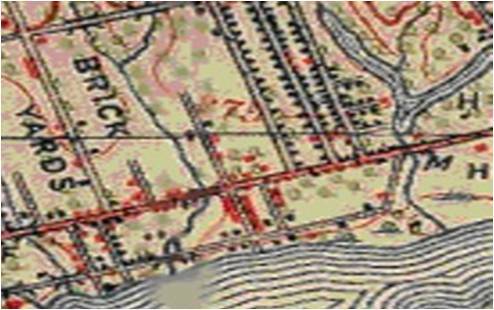 There are, of course, shacks scattered all over “Shacktown” but they were not considered even houses by the those who drew up this map for fire insurance purposes. So they are not marked. Morley Avenue is Woodfield Road. Applegrove became part of Dundas Street in the 1950s. The subdivision and lot numbers are clear on this 1910 map, making it easier to research the history of individual houses. Robin Burgoyne of Caerwent House Stories is that expert on this. 1907 Dominion of Canada topographical map. Coxwell Avenue is beginning to fill in with houses and Rhodes Avenue is built up too. Erie Terrace has houses on the one side. 1923 Dominion of Canada topographical map. The neighbourhood west of Coxwell is beginning to look more like that of today. East of Coxwell is not yet build up yet although real estate agents were trying! 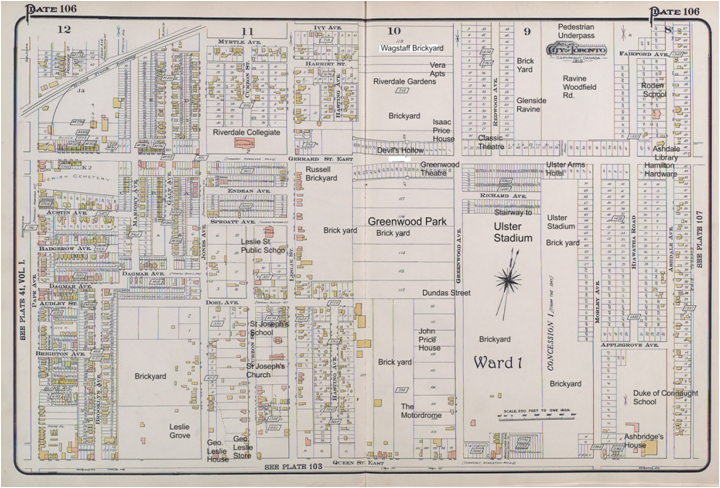 The big open area between Greenwood and Woodfield Road south of Gerrard will, in1925, become the Ulster Stadium. The Duke of Connaught School is marked S for school as is Roden School north of Gerrard between Ashdale and Hiawatha. The streets are lined with bungalows and larger houses. There are still a few shacks, probably being remodelled and added to, but Coxwell-Gerrard is no longer Shacktown. 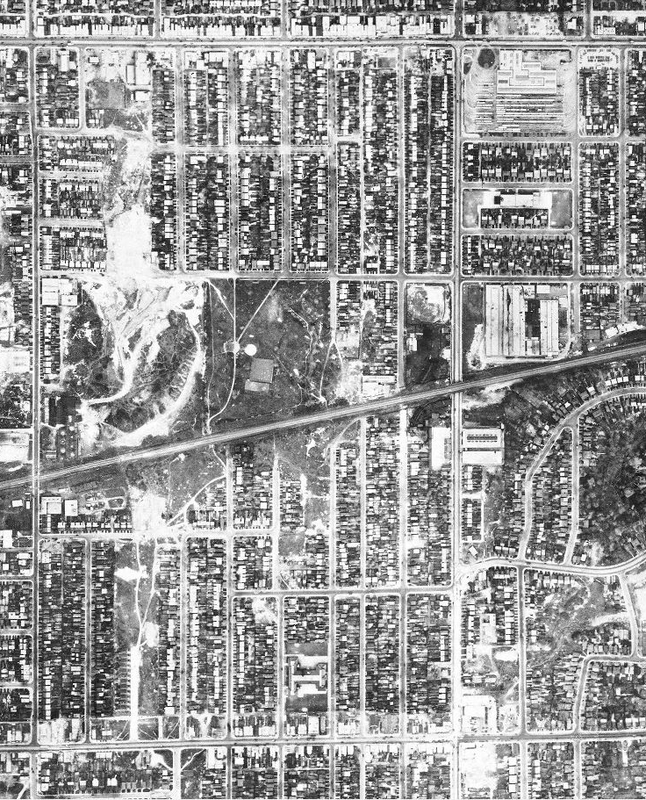 A 1947 Dominion of Canada aerial photo. Goad’s Map 1910. I have added labels. I know many people may not enjoy maps. So I put this one last map in as a reward for those who don’t like maps but read this post anyway. 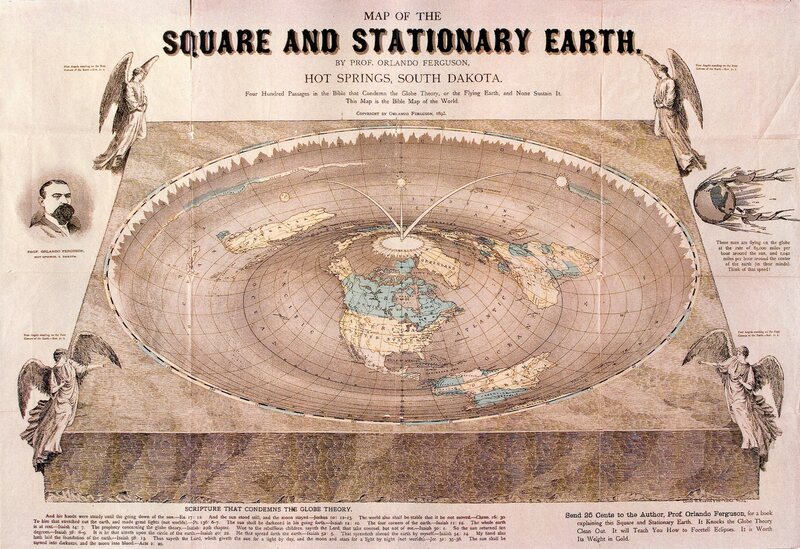 A “Flat Earth” map from the 19th Century. Some days I do hope angels are holding the whole thing up!